I’ve just got access to a short video made for the Teaching English British Council facebook page at IATEFL Manchester 2015 which I’d completely forgotten about! In it, I describe a method you can use to encourage students to notice mistakes they make in writing and try to reduce them. Unfortunately I can’t embed the video here, but I can give you the link to watch it. I’m not sure if you need to be logged in to facebook to see it, and I don’t know how to get around it if you don’t have a facebook account – sorry! You can see examples of how I used this kind of error categorisation in my own Russian learning in the ‘Writing’ section of the post How I’m learning Russian (part 2). This has been my most enjoyable IATEFL conference so far. I gave a talk on using journals with students which went well, despite a couple of initial technical hitches – thanks for your help, David! I missed a few talks I wanted to see, but have managed to catch up with at least some of them through the power of the internet. I was very happy to win two prizes, one of which was a book which was on my wishlist, and I also bought myself a couple of other books I wanted. The conference centre, Manchester Central, was excellent: easy to get to, easy to navigate, clean, modern, and with excellent wifi – I never had to fight it once! I managed to tweet throughout: according to the downloader I’ve used to help me compile my posts, I sent about 1500 tweets during the conference! I appreciated the responses I got which justified me doing so. Those tweets have also enabled me to put together my blogposts after the conference. However, as always, the highlight of the conference was the people. I met a few members of my PLN (professional learning network) who I’ve been wanting to meet for a very long time. Lots of the lovely followers of my blog came and said hello and thank you – it makes it all worth it! There were also lots of comments about how much tweeting I did and Jo Budden challenged Joe Dale and I to a tweet-off. Next year? There was a baby shower, with lots of PLN love. I caught up with good friends, and missed a few who were absent (See you next year, Katy?). I had dinner with CELTA and Delta trainers, and very much enjoyed listening to their stories, as well as lunch with my fellow curators from ELTpics (We missed you Julie!) I also had lunch with my CELTA tutors, being able to properly catch up for the first time since I finished my course in February 2008. Thank you IATEFL, and see you in Birmingham next year! Laura’s talk was on at the same time as mine so I wasn’t able to watch it. I know it started with her ‘having a cold’ to demonstrate how we can make meaning evefn when the sounds we hear don’t correspond with our expectations, and I’m intrigued to hear more about her suggestions. She’s shared her presentation, and hopefully there will be a video of at least some of it soon! Lizzie‘s talk was also in the same slot as mine and Laura’s – so many possible times and they put us all on in the same one! 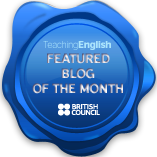 Lizzie has written a lot about autonomy on her blog, and demonstrated it with her own Italian learning. The aspect of learner training is key when trying to encourage autonomy, and is one I’m sure Lizzie’s presentation would have helped me with. Thankfully, she’s blogged about it as has Olga Sergeeva, but it’s not quite the same as hearing it first-hand. 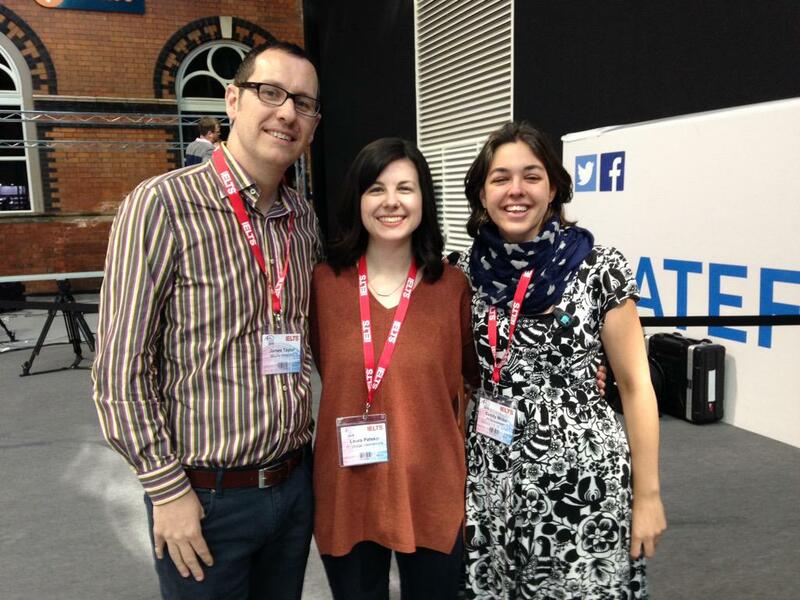 I’m hoping the gods of IATEFL shine on all three of us next year and put us on at separate times! As with last year, the talk which Russ was involved in is one of the ones which seems to have taken on a life of its own after the conference. Nicola and Russ picked a subject which is another very important discussion point, after Russ tackled the myths of EFL in 2014. [Original text (see comments for why I’ve kept this) As with last year, Russ’s talk is the one of the ones which seems to have taken on a life of its own after the conference. He has a way of picking subjects which are very good discussion points, and this year he was ably assisted by Nicola Prentis.] Their talk immediately followed my own and was in a tiny room, so I knew it was wishful thinking to believe I might get in, but I tried anyway. A whole group of us were waiting outside, disappointed. 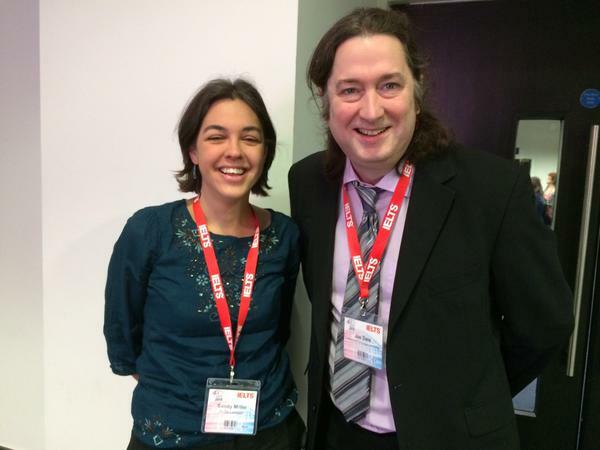 Last year Russ’s talk was officially recorded (content is currently being updated on the IATEFL 2014 site), and Russ and Nicola have recorded their own version this year – thank you! This area is one of particular interest to me, being a woman and in ELT as I am. 🙂 Through the Fair List, I’d become aware of the fact that plenary speakers at conferences are often men speaking to a room full of women, which seems odd. As I understand it, Russ and Nicola were questioning the fact that men feature dispropotionately at the ‘top’ of the ELT profession, despite it being a female-dominated one in general. P is for Power: Scott Thornbury questions the balance of power in the ELT profession, not just in terms of gender, but also covering native/non-native speakers and the socio-economic circumstances that teaching takes place in. 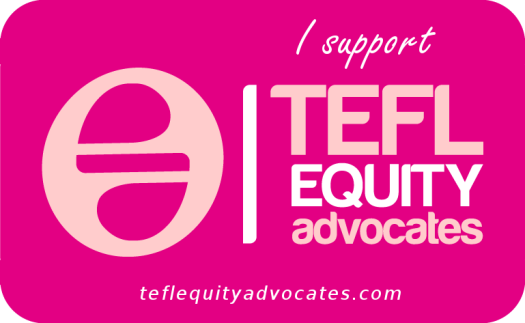 Russ and Nicola have also set up their own website to examine gender equality in ELT, with a lot more information about their research. At other points in the conference there were tweets about increasing the number of non-native speakers visible at conferences and in the global community. #Iatefl give @teacherhigor a plenary next year so a non-native can stand up and discuss the role of language development for Non-NESTS. I saw Emina speaking about helping Arabic students with spelling at IATEFL last year, and she subsequently very kindly wrote a guest post summarising her talk for this blog. I’m hoping to encourage her to do the same again this year, as her ideas are very practical and deal with areas which there isn’t much coverage of in the literature I’ve read. I really like Luke’s focus on playing with language, which is something I’ve become more and more interested in. Olga Sergeeva went to Luke’s talk and wrote a summary of the whole thing, although she admitted it was difficult because they were laughing too much! John has shared his slides, which gives me a taster of the tips he has for developing these skills. I think the most important idea is to ‘develop a materials radar’, which echoes what Ben Goldstein and Ceri Jones talked about in their presentation on using images at the MAWSIG PCE. Mike Harrison talked about using Vine to make short videos, and Shaun Wilden and Nikki Fortova looked at apps on the iPad to do the same. These are things which I retweeted because they made me think. I’m sharing them here to make sure I don’t forget those thoughts and to see what you think. They’re loosely grouped into topics where possible. #IATEFL Pete Rutherford: you can be a B1 student but able to communicate more competently than those at say C1. These link back to Joy Egbert’s plenary. An opportunity for anyone wanting to get into materials design? #mawig #iatefl Authors lose income through illegal downloads, but there is also a need for free resources. #mawig #iatefl @FreeFairELT @esolcourses also making the point that free to use is not always the same as free to copy. #mawig #iatefl @FreeFairELT will be preparing a document on Creative Commons to help people. Patsy’s accompanying blogpost is available on the OUP blog. Yes, yes, yes to all of these! #Iatefl Jonathan Marks: what we often perceive as unusual new random coinings may well be old usages that have lain dormant for years. @sandymillin @teachAdam I’m really hoping there’ll be a book at some point…looking forward to hear what next cycle brings. Lots of people were blogging throughout the conference. 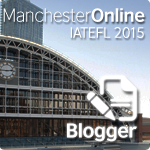 You can find a full list of all of the IATEFL Manchester registered bloggers on the ManchesterOnline site. As always, Lizzie Pinard was very prolific, and has helpfully indexed all of her posts. Apart from the plenaries, I only went to one of the same talks, so there’s a lot to catch up on! Olya Sergeeva also has an index of the posts she wrote about the sessions she went to, including some which I’ve linked to above. Tyson Seburn wrote about his bite-sized takeaways from the conference. Jen McDonald summarised the talks she saw in short paragraphs. The British Council had a number of roving reporters at the conference, one of whom was David Dodgson. Apart from the many sources I’ve mentioned above, there is, of course, the wonderful resources that is IATEFL online, full of interviews and recorded sessions, at least some of which I hope to find the time to watch at some point in the future. Are there any you would particularly recommend? I’ve moved away from the classroom over the past year, so for the first time at IATEFL I didn’t go to many talks which fitted this category. I got some interesting ideas from all three talks, and can’t wait to try to put them into practice when I finally do get back into the classroom in September! Ken‘s title seemed like a pretty dramatic claim, but that’s exactly what he showed us, and I really want to try it out! He started by telling us some of the problems with the traditional approach to reading, mostly the fact that many of the skills used in the classroom are not easily transferable to real life. Students don’t have tasks like a pre-set gist question or vocabulary that somebody else has pre-selected from the text for them when they read texts outside the classroom. He decided that there must be a better way to prepare students for reading in real life, and this is what he came up with, working through a demo lesson based on a short story as an example for us. You can get the story Ken used with us (A Secret Lost in the Water) as well as more information about the whole process by going to his website, clicking on Activity books > A New Way To Teach Reading > IATEFL. What are the key characteristics of a short story? List them. e.g. Only two or three characters. One or two settings. Turn these characteristics into questions. e.g. Where is it set? What is the relationship between the characters? Show students the title. They add to the list of questions. Choose one of the questions as a good gist question. Read for gist, answering the question selected. As a side note, one of my favourite moments of the whole conference was how Ken got us to read fast: everybody stood up, and had to sit down once they had the answer. Still standing after everyone else has sat down? Too slow! Choose other questions from the list as comprehension questions. Read again more slowly to answer them. Underline any words which you’re not sure of the meaning of. Choose one of the words and analyse it to try to decide the meaning: What part of speech is it? Are there any clues in the parts of the word (e.g. prefixes/suffixes)? Do the adjacent words help? Come up with a synonym or phrase which you could replace it with and try it in the space. Does it make sense? Repeat as necessary. Choose 10 collocations that you think are really useful for you. Compare your list with a partner. Divide the class into groups, each with a different coloured board marker. Groups come up with discussion questions related to the text. They can’t be yes/no questions and you shouldn’t be able to find the answer in the text. Write them on the board. Students choose some of the questions from the board and discuss them. This strategy was very engaging as all of the questions were written and selected by us, and we managed to create the questions before we’d seen the text, in a way that is eminently transferable to any text type and can easily be used outside the classroom too. Repeated practice using the same lesson structure will make students more confident with their reading, and similar staging can also be applied to listening too. It encourages greater awareness of the conventions of different genres which should have a knock-on effect with writing too. If students are unfamiliar with a particular genre, you can analyse it with them the first time they see it. Vocabulary is chosen by the students rather than the materials writer, and they decide what is and isn’t useful for them. There is a lot of processing, which aids memorisation, and students are able to check it in a dictionary too if they want to. Coming up with their own discussion questions promotes critical thinking and a deeper reading of the text. Tyson’s EAP (English for Academic Purposes) students often have trouble understanding texts to a deep enough level to be able to discuss them intellectually or engage with them in their written work. When reading, they tended to treat texts very superficially and only deal with problems with lexis, with looking at the concepts at all. Academic Reading Circles were developed out of the idea of literature circles as a way to address this by dividing students into small groups and assigning them different roles to break down a text. Each group works on a single text and has time to prepare before the lesson. They then come together and share their knowledge to build up a deeper understanding of the text. Leader: gauges group comprehension and situates the text for the other students, dealing with the purpose for reading, source, target audience, etc. 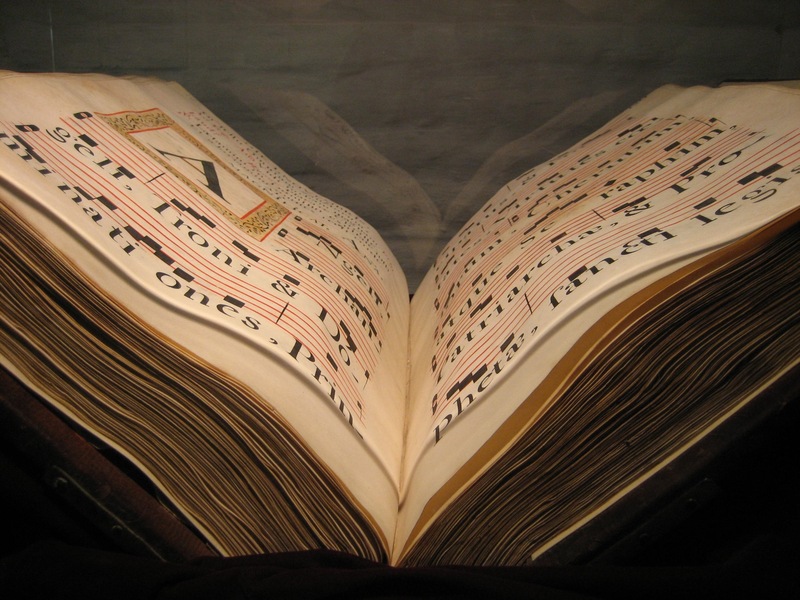 They create one or two questions about the text to gauge understanding. Contextualiser: picks out contextual references like times, dates, places and people and finds out more about them. Visualiser: finds anything from the text which can be visually represented, e.g. maps, photos, videos, etc. Connector: makes connections to outside sources, for example other events, other sources or their own experience. Highlighter: focuses on linguistic problems, e.g. unknown vocabulary, topic specific language, anything which shows the feeling/attitude of the author. 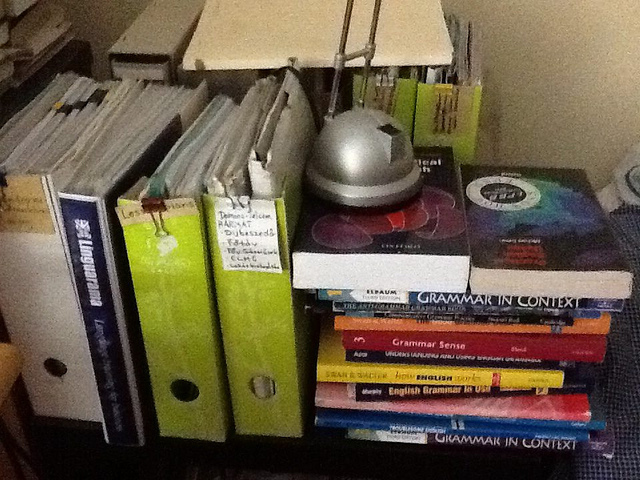 The students deal with up to five texts per term, and no more than one per week, rotating the roles through the term. Academic reading circles lead to deeper comprehension and their writing also improves as a result, including a greater use of topic-specific language. Lizzie Pinard wrote a summary of the session. You can read more about Academic Reading Circles on Tyson’s blog, and he is working with The Round to produce a book about them. I’m sure there must be away to apply this approach to other kinds of reading group too. Questions: Show students an artwork/poem. Give them post-it notes. Every time they have a question, they write it on the post-it and stick it to the board. The questions can be as deep or as trivial as they like. Students then go away and find the answers to their questions. Tug-of-war: Show an image/quote etc conncted to an issue which could be debated. Hanna’s example was images of the Aral Sea showing how it has dried up over the last few decades. Students put their opinions on post-it notes, then rearrange them according to where they would fit in a debate. It’s a good way of dealing with potentially controversial issues. Numbers: Students chose numbers which are important to them, then share why with other students. They aren’t forced to give information which they don’t want to, as would be the case if the teacher supplied questions for them to answer. Mingle: Find two things in common with each person in the class. You can’t repeat them. Once they’ve finished, each student draws around their hand. Other students write what they learnt about their classmates in the relevant hand. Thank you: Stick a piece of paper on each person’s back. Students write what they’d like to thank each person for – again, it can be as trivial or as deep as the students want. All correct: In an multiple choice exercise which should have only one correct answer, get the students to justify why any of the answers could be right. This works particularly well with answers where changing the tone of voice could make a big difference. Senses: Dictate the five senses. Then dictate random words, with students deciding which sense to allocate it to. They then share answers. Map: In a similar way, give students a blank map. Dictate words and students write them where they ‘should’ be, entirely based on their own opinions, before sharing answers. Playing cards 1: Hanna has a set of playing cards with pictures of artworks on them. She selects three at random and arranges them on a piece of paper. Students have to justify why they are arranged like that. Playing cards 2: Each group gets 6 cards. They choose 3 and arrrange them. Other groups then have to say why they were arranged like that. They can then compare their justifications. Exploiting the coursebook: After using a text, students are challenged to write questions to which there are no answers in the book/text. Another group then gets the questions and has to rewrite the text to include the answers. Vocabulary: Draw a picture of a bicycle, but you can only include the parts that you know the names for in English. Choose which six items you need to learn to be able to compelte your picture. This is particularly good for mixed-level groups. Shapes: Each group gets five slips of paper. On each they write one part of the body and arrange them into the approximate shape of a body. The teacher can offer/add more words. Students then group the words according to different categories, e.g. touching the bed/not touching the bed, important for work/not important for work. Points of view 1: Have three chairs. Each represents one role, e.g. mother, daughter, dead guinea pig. Students ask questions and decide who should answer them, e.g. Was she a good owner? Points of view 2: Set up a roleplay situation, e.g. breakfast time. Students start the rolleplay, but anyone watching can step in and take over at any point. By encouraging visible thinking we encourage different points of view, build community and encourage critical thinking. You also move away from the ‘tyranny of the correct answer’. Start with simpler activities (like numbers/mingle) to introduce these ideas slowly and to build an atmosphere of sharing in the classroom. You can find out more about thinking routines in the book Making Thinking Visible [affiliate link]. From August I’ll be the Director of Studies at IH Bydgoszcz in Poland, and in preparation for this I’ve been reading and listening to blogs, books and podcasts about management. Observation will also be a key part of my role, as well as being relevant to my work as a CELTA tutor. 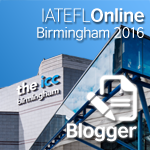 I’ve therefore grouped the talks I saw at IATEFL on these topics into a single post. 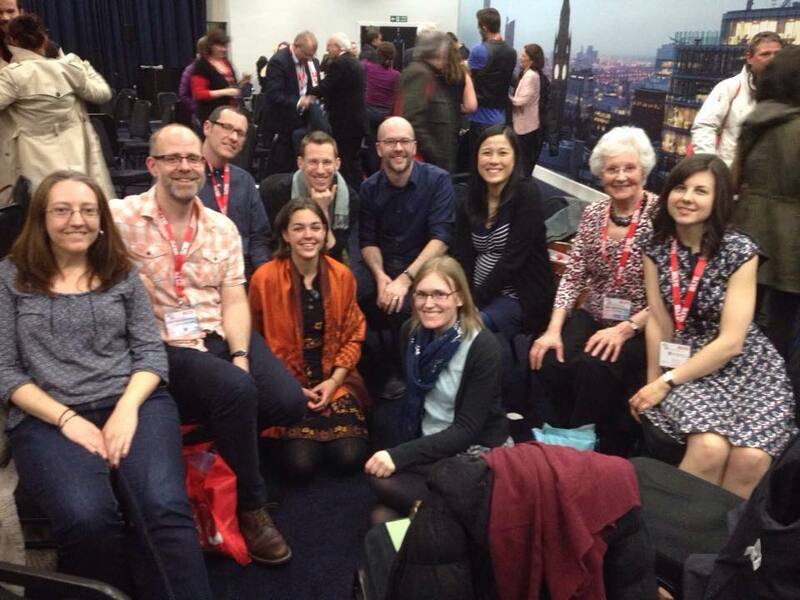 This was my first experience of an IATEFL forum, and I decided to go on the spur of the moment. I’m glad I did, as it gave me ideas for how to encourage teachers to take part in a peer observation programme, and showed me some of the potential problems with setting one up. Gihan works at King Abdulaziz University in Saudi Arabia. She decided to research how experienced EFL teachers (5-20 years) perceive peer observation, in contrast to most research which focuses on relatively inexperienced teachers. How the outcome of observations may influence their career. Psychological/emotional tensions, including a potential distrust in the peer doing the observation. Feeling threatened because there’s a risk that they might lose some of their reputation if the peer doesn’t understand what they are doing. A rejection of changes in their habits: comfort zones are difficult to leave. Doubt in the outcome of any changes they might make as a result of observations. The potential stress involved in participating in peer observations, and the fact that this can be avoided by doing other forms of CPD, like going to conferences. Their beliefs were also shaped by past experience and ‘professional coursework’ (e.g. formalised training, books read). Most studies focus on external factors influencing whether teachers are willing to participate in peer observation schemes, but Ismail found that actually internal factors were dominant. For example, issues like fear and/or a potential loss of face in front of a less experienced colleague were more likely to make teachers want to avoid peer observation than factors imposed by their employer. It wasn’t helped by the fact that in most cases there was no pre-observation meeting to set up what the observed teacher and the peer wanted to get out of the observation. Her research suggests that teacher needs should be examined more carefully in workplaces, where student needs tend to dominate and teachers’ needs are secondary. Shirley described a successful peer observation scheme which was set up at the London School of English, where teachers have between five and thirty-five years of experience. officially encouraged, but rarely happened unless there was an inspection. management-led, with teachers being told who they should see. contrasted with the atmosphere of collaboration in the staffroom: you can’t come into my classroom! mostly focussed on quality control, rather than developmental aims. To be able to implement a peer observation scheme which would work, they started with a questionnaire to collect opinions about peer observation, and discovered many points which echoed Gihan’s findings in the previous presentation. Everyone agreed peer observation was a good thing, but nobody actually wanted to do it! Problem: Increased workload for teachers. Solution: No formal paperwork required for management. Peer observation is supposed to be development, and there doesn’t need to be proof of this. It’s between the teachers involved. Problem: Lack of management buy-in. Solution: Make it a sacred part of the timetable and find a way to ensure it is never dropped. Problem: There’s no chair for the observer. Solution: The teacher doing the observation provides the chair. Spending time on these ‘what ifs’ makes teachers more relaxed and more likely to want to participate. No matter how minor they may seem, these are genuine fears which may scupper your programme, so you need to take them seriously. Now each teacher has an allocated week in the school year which is their opportunity to peer observe. Within that week they are allowed to choose anybody to observe and they will be covered if necessary to enable them to do so. This happens regardless of anything else going on in the school (illness, inspections etc) as otherwise the programme would fall apart. Up to two teachers may have the same week allocated – more than that makes it difficult to cover everyone. Even generally disengaged teachers did peer observations willingly with this system. As for those being observed, you can only say no to somebody coming into your classroom if you’ve been observed within the previous four weeks. Observations are included on the school’s weekly planner and email reminder is sent out to those being observed. Management doesn’t tell them who or what to observe: that is entirely up to the teachers involved. The only requirements from management are that each observation has three steps: pre-observation meeting, observation, post-observation meeting (these can be as long or as short as the participants like). Everything above is codified in the guidelines for the scheme. Overall, the aim of the scheme is to share best practice, with everyone learning from each other. Learning ways of dealing with critical incidents in the classroom. Observing learners from a different perspective (when observing a class you also teach). They have tried a variety of different peer observation systems. An open-door policy was seen as being too radical, so they decided to have a sign-up sheet instead. Teachers have been issued with red cards which they can put outside their door if they feel it would be a bad time for an observer to come into their lesson. Although they have never been used, it makes them feel safer and more willing to accept observers. Because of the problem of cover, many observations are only 10-minutes. 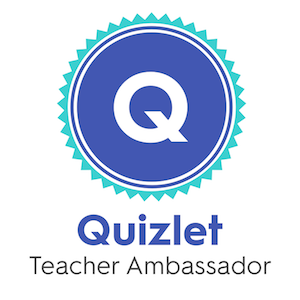 These are particularly useful at the beginning of a class as teachers are more likely to be willing to relinquish their students to another teacher at this point while they go and observe. Once every two weeks, they also run workshop sessions for the students which require fewer teachers than traditional classes do, leaving teachers free to observe other classes. Blind observations: The lesson is discussed before and after it happens, but there is no observer in the room during the class. Video observations: The lesson is discussed before, videoed on a mobile phone, then specific sections of the lesson are watched with the observer. This removed the fear of having another person in the room. The pre-observation chat is very important, regardless of the manner of observation. This is when the focus of the observation is decided on as well as how feedback will be conducted. To reduce paperwork, teachers only complete an observation log showing the time, date and focus of observations. No other paperwork is required by management. To maximise their potential, observations take place throughout the year, rather than only once or twice, and they vary in length to help teachers fit them in. Teachers are encouraged to keep a reflective journal of what they have learnt from the observations, both as observed and observer. They don’t have to show it to anyone, but can if they want to: What have I learnt? What questions does it pose? Peer observations are also the subject of workshops the school holds, including discussion about how to develop the scheme further. These workshops take the form of debates and happen every 2-3 months, covering a whole variety of topics (not just peer observations). They sound like an interesting idea, and one I’d like to experiment with. 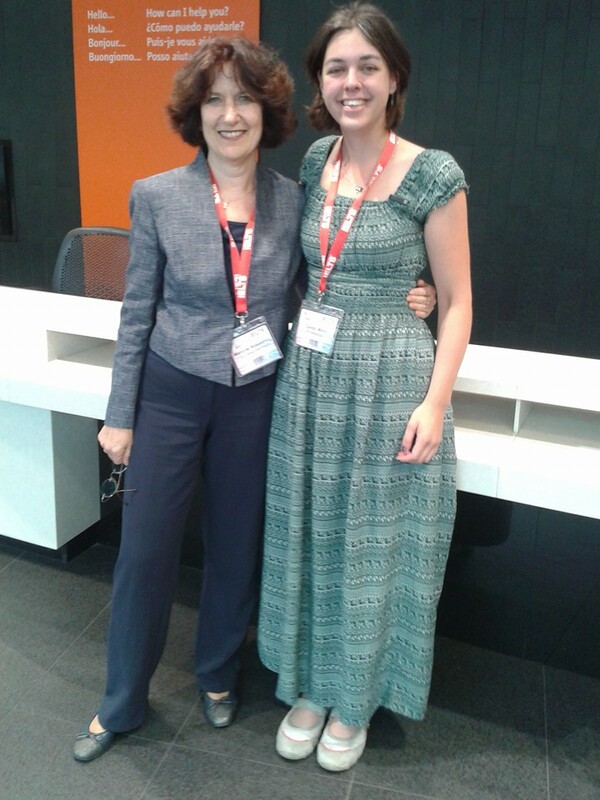 Dita and Ela met at IATEFL Harrogate last year, and quickly realised that they had quite similar teaching profiles in terms of their experience and length of time in the classroom. They were also both based in Oxford. Ela returned to the classroom at around the same time, having taught 121 for a long time. She asked Dita to observe her to check some of her classroom management techniques. Dita asked Ela to observe in return because she didn’t want to get stuck in a rut. They found the experience so useful that they decided they wanted to turn it into something more formal, and their peer coaching project was born. A confidential process through which two or more professional colleagues work together to reflect on current practices; expand, refine and build new skills; share ideas; teach one another; conduct classroom research; or solve problems in the workplace. Reflecting together, learning from each other. Listing their individual and professional goals before the project started. Meeting regularly to discuss their lessons, things they had read/watched and teaching in general, working together to solve problems and build their knowledge. Because they were working with an experienced peer, the discussions could go into a lot of depth. They supported each other as critical friends. Observing each other’s lessons for specific details. They originally taught at different schools, but Ela later moved to Dita’s school. They told their managers what they were doing, and received support with timetabling (among other things) to make their project possible. Audio and video recording lessons. Giving feedback to each other on lessons and suggesting small tweaks they could make to change them. Keeping a teaching diary, which formed the basis for future meetings and ideas for observations. Ela colour-coded hers: change, improve, important. Teaching each other’s classes: they could focus on their learners while the other teacher led the class. When students asked why this was happening, it evolved into a discussion about the nature of teaching and learning, and students were interested in how they were developing their teaching. As a result, Dita became more comfortable with asking her students for feedback on lessons. For Dita, the project encouraged her to leave her comfort zone, and she decided to work on a CELTA at a different centre, giving her more material for development and reflection. Easy to incorporate into your work schedule (especially with the support of managers). You build a closer relationship with a colleague. Mutual motivation because you don’t want to let your peer down. Can see continuity and progress throughout the year. Set up ground rules, including confidentiality and how you will give feedback. Decide what forms of coaching you will include (see ideas above for inspiration). Set goals before you start and review them regularly. Decide what you hope to achieve with the project as a whole. Inform management and gain school support if possible. Be open and honest about what you are doing. Evaluate the project when you have finished. Because there was no requirement to grade or assess the lessons, they both found it very liberating and learnt a lot. I’m here to improve and to learn. Their students also benefitted. They both gained confidence in their own practice and abilities as teachers, as well as the courage to experiment more with their teaching. Here’s Olga Sergeeva’s summary of the talk. I was interested in this session because IH Bydgoszcz has a system of lesson planning in groups, and I wanted to see how someone else uses the same technique. Tom is a member of a group called Berlin Language Worker Grassroots Association (or Berlin LW GAS for short), which was set up for a whole range of reasons, one of which was to help reduce the feeling of isolation among the many freelance teachers working in Berlin. Lesson jams were designed as a fun way to get together for a few hours with other teachers and be inspired by each other and a random prompt (you might find some inspiration on my other blog!) to come up with a lesson plan. There is a step-by-step process for this, culminating in each group sharing their plan with everyone there. The aim of the jam is to be creative and to learn from each other. They also share the final plans on their website, and they’re currently looking for more ideas on how to work with the finished products after the lesson jam. So far, they’ve had two very successful jams and will continue to hold them in the future. If you’d like to set up your own lesson jam, there is a downloadable guide including all of the stages on the Berlin LW GAS site. What is the difference between an inspiring manager and a mediocre one? How does an inspiring manager make you feel? Why is it so hard to be inspiring? It requires time to connect with people at an emotional level, and if there’s one thing managers are short of, it’s time. Our stress levels build up because we’re constantly ‘on’ and this leads to us ignoring the warning signs of stress until it’s too late, much like boiling a frog. This leads to us becoming uninspirational micro managers. Emotional intelligence: being aware of your own emotions. Cognitive intelligence: interpreting what is happening in the world around you. Demonstrates compassion (showing that you care and that people feel you care) – following the recipient’s agenda: what motivates them? Shows mindfulness (you are ‘with’ the people you manage, not thinking about other things) and attention. Be fully aware of where you are and what you’re doing. If you know it’s not a good time and you can’t give your full attention, act accordingly: postpone the meeting, ask to speak to them at a specified later time, etc. Spreads positive emotions: the more powerful your position is, the more likely your emotions are to affect other people. Fiona was put this talk together as a result of a free 8-week Coursera course she followed called Inspiring Leadership through Emotional Intelligence, which she highly recommends. Her blog contains many more insights into managing LTOs. Following on from the excellent MaWSIG pre-conference event, I ended up going to quite a few more talks related to materials writing during the conference. Here are summaries of said talks. Sonia and Susan work on the MA TESOL at the University of Huddersfield. The course originally had only a traditional dissertation at the end of it, but they have now added the option of a more practical materials design project rather than a dissertation. Students have to create 15 hours worth of classroom materials for a specific context and do a 30-minute viva. The only course participants who now do a dissertation are those who are required to do so by external forces, such as those who are being funded by a Ministry of Education. All others opt for materials design. Why did they choose to offer this alternative? Feedback on the dissertation module was not as positive as for other modules on the MA, with participants complaining that they couldn’t collect the necessary data from their students over the summer. Materials design doesn’t just help those who are creating materials; it also helps teachers to be more critical when choosing materials for their students. Show an awareness of their context: What are the constraints? Are these materials appropriate? Only citing a narrow range of authors. Not referring to SLA (second language acquisition) theorists. Sticking to authors writing about materials design only. Not referring to authors specific to their context (e.g. EAP). Not mentioning issues like Global English or English as a Lingua Franca. Conflating literature and theory and not going deeply enough into the theory. Not demonstrating enough criticality: for example by comparing authors or mentioning the weaknesses of the research. Being quite superficial. Make the use of theory more explicit and show students how to find theory more usefully. Emphasise that theory is the core of the module. Stop students from getting lost in the aesthetics of the materials – they tend to spend too long on this and not enough time on the theory. Train students to do better literature searches. I haven’t done an MA yet, but would like to at some point in the future, so I think this will come in very useful when I get to that stage. I’ve been connected to Jill on facebook for a while, and she’s been able to help me out a couple of times, so I went to this talk to be able to meet her in person for the first time. It gave me lots of ideas for potential workshops in the future, and furthered my understanding of some of the principles behind materials design, following on from the talk above. It’s also encouraged me to consider in more depth the principles I believe in/follow/use (What’s the right verb?!) when designing materials, teaching, and training. They are a kind of limit, and you shouldn’t include anything which does not adhere to one or more of these principles. In contrast, core energies suffuse your work. They are the underlying themes of your materials, which resurface again and again, but may not be obvious in every activity. In Jill’s journal, these were Affect, Creativity and Play. The example Jill gave to show the difference between the two types of principle was that she believes all activities should be communicative (framing principle), but that there are times when activities should be cognitive, logical or serious depending on the aim (which could be seen as contradicting some of her core energies). Does this activity fulfil the aim in the best possible way? Is the staging in the best logical sequence? Does staging scaffold the students by providing achievable steps? Are the groupings appropriate to the task and do they provide variety and balance of interaction? She also noticed a system of checks and balances that stopped her forward progress at times. These included trying out the materials by putting herself in the position of the teacher (imagining), the student (trying out), or the writer explaining the materials to the teacher (dialoguing). Through this process, she sometimes discovered that her activities didn’t do what she wanted them to, which meant she had to rethink them. Once she has finished writing, Jill uses checklists based on questions formulated from her principles. These help her to ensure quality, coverage (a range of activity types/interaction patterns etc) and analyse covert syllabuses (a hidden agenda). Covert syllabuses can be positive, for example by promoting rapport within the group through activities focussing on dynamics and groupwork, or negative, such as those implied by the kind of images that might be chosen to illustrate a course book (see Ben Goldstein and Ceri Jones’ talk at the MaWSIG PCE). Pyramid discussion, where participants first detail their own principles relating to materials design, then compare them with others. Look at the principles you have related to classroom practice and consider them in more depth. Which of them are supported by research? Which of them do not seem to have theoretical support? Why do you think this is? Give participants a range of different activities from published materials, chosen to demonstrate a range of writing styles. Analyse how much they like doing the activity, how often they create similar activities and how much they like creating that kind of activity. Analyse the principles you have come up with in more depth. What are the potential advantages and drawbacks of having these as principles? Can these principles be justified by theory and classroom practice? What questions should you ask yourself about being driven by personal preference in your writing? Dialoguing: participants work in pairs, with one as the classroom teacher and the other as the materials writer. The writer must justify their design decisions to the teacher. Record the conversation, play it back, and see if there are any decisions the writer wants to rethink. Imagining: go through the activity step-by-step, as if you’re using it in class. Record yourself talking through the process, then listen back and analyse it critically. Is there anything you would change? Trying out: put yourself in the students’ shoes. Record your interactions. Listen back and ask yourself questions. For example: Did the activity produce the language required? Did it produce enough of it? Was it engaging? Did everyone have equal turns? Spoken protocols: participants design an activity and verbalise their decisions as they make them. Record this and listen back, with participants trying to verbalise what unspoken design principles are influencing these decisions. Take an activity you have designed and try altering one element, for example, changing it from a pair to a group task. What effect does this have? Develop your own checklists based on the principles you have uncovered. Use them! When Ben and Ceri started teaching, cultural content in coursebooks looked very different. It tended to reflect and/or reinforce cultural stereotypes, drawing on students’ prior knowledge of the world. There was a lot of pop anthropology or negative etiquette, ‘othering’ the cultures discussed by distancing students from it: ‘They do it like this, not like you do.’ It also reinforced the idea that everyone in a country acts in the same way: ‘Americans eat fast food’. Subliminal cultural content was also common, for example in the choice of images used. Compare menus served by McDonalds in different countries. Question what junk and healthy food really is. Look at the designs of McDonalds restaurants, and how they differ around the world, for example the McCafé. Find local news articles featuring McDonalds. Continuing the food theme, try exploiting these food flags, designed for the Sydney Food Festival. Each image showcases food typical of that country. Students can identify the food, then decide whether they think it really does represent the country. Finally, they create a flag for their own country and other students discuss whether it’s truly representative. ‘Breaking’ stereotypes in this way can be a very productive exercise in the classroom. Something similar can be done with postcards too: do they reflect true experiences of what it is like to be in the country? Ben and Ceri have written various course books together. The most recent are the Eyes Open series, written for secondary school students and published by Cambridge University Press. They have used ideas to exploit culture throughout, and showed examples like this one during their presentation. There is a move away from stereotypes, showing a more multicultural view of Britain. Texts also have links to the outside world, so that the restaurant mentioned is a real place which students can visit the website of if they want to. You need to build a bridge between the materials on the page and the lives of the students. One way to do this is to have the voices of ‘insiders’, rather than ‘outsiders’, talking about their own cultures. The example Ben and Ceri gave was a video about dabbawallas in India, leading on to a discussion of whether this system would work in the students’ own countries: What kind of food would they include in the boxes? Who would cook it? Another avenue for uncovering culture is to emphasise the trans-cultural flow of ideas, rather than separating out cultures artificially. One way to do this is through YouTube videos and the associated comments, like those by Bethany Mota, who often shares videos about food. The ‘unboxing‘ meme is a productive one, and this video of an American opening a pizza in Korea gives lots of language students could draw on to make their own video, making the connection to their own lives and culture. Here is an abridged version of Ben and Ceri’s slides. Hugh’s attitude to the use of images in materials has developed over his writing career. Originally he thought they were just a way of breaking up the page, and that the focus should be on language, because this is what students learn from. When his publisher changed and he was asked to incorporate more National Geographic content into his materials he was initially reluctant, associating them with doctors’ and dentists’ waiting rooms and pain! He also highlighted the fact that although many of their images are beautiful, they aren’t necessarily great for generating language. They say 1000 words, so you don’t have to. Instead, he finds images which have the potential to ‘bring 1000 words into being’ much more useful. 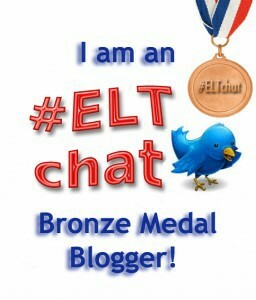 So what are the functions of the image in the ELT classroom? To illustrate the meaning of lexis. Learners can label things, but it’s not great for longer phrases. To test whether students have remembered lexis. This is great for nouns, but not so good for things which are more abstract. Prompts for grammar drills. Hugh mentioned ‘English for voyeurs’, which is true whenever you use images to practise the present continuous! To generate language and ideas. To generate discussion, stories, opinions, etc. The last three are the ones which are the most fruitful, but they require a certain type of image, preferably with some kind of ambiguity or something unstated. In Outcomes, the picture above is used to introduce a unit on business. One of the discussion points is why there are no women shown. It then leads on to a unit about business, including making phone calls. The same principles which apply to images could also be used for videos. Again, just because it’s on YouTube, doesn’t make it interesting. There is no guarantee that the language in the video is intelligible, appropriate for the level of your students, or will ever be used by them again. Once you’ve found a suitable video, you still have to write the materials to go with it too! This is where video content accompanying coursebooks comes in. In Outcomes, video is exploited in a variety of ways, not just for traditional comprehension tasks. It’s also a way of improving students listening skills by analysing small chunks of language, and then attempting to reproduce them to experiment with their pronunciation. You can watch the whole 30-minute presentation on YouTube. This was my first IATEFL since I became a CELTA tutor, so I had a whole new set of talks to discover. Here are the three I went to, all of which made me think about how I approach CELTA tutoring and what an ‘ideal’ course would look like. I’ve found Jo’s CELTA training videos very useful and enjoyed a meal with her and a few other CELTA and Delta trainers at the beginning of the conference, so was looking forward to hearing her speak, and I wasn’t disappointed. 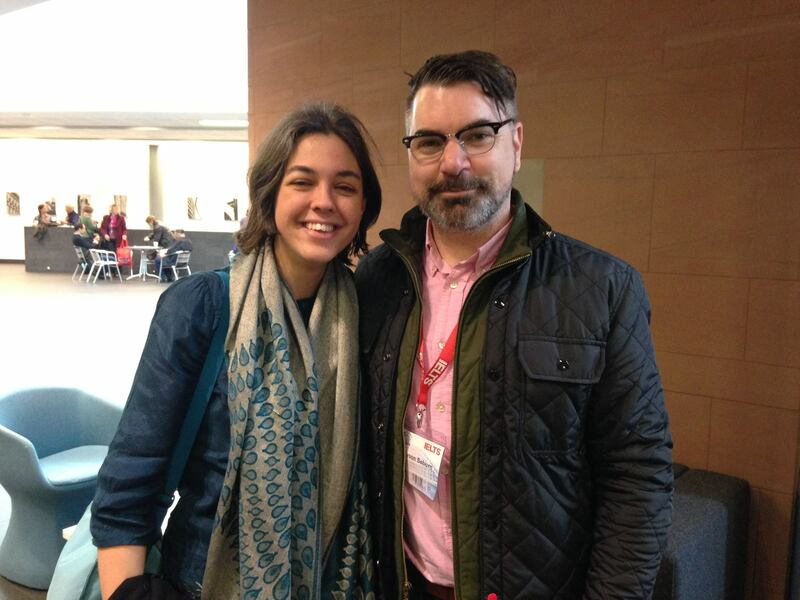 Jo compared the role of CELTA tutors to that of judges on the BBC programme Strictly Come Dancing. Each of them has a distinctive personality and gives feedback in different ways, which reflects our roles as CELTA tutors. She asked us to consider which of the judges we are similar to, and how this may change throughout the course or with different trainees. She also talked about differentiated grading scales (compared to ‘To Standard’ and ‘Not To Standard’ from Cambridge), and how this can create standardisation issues. On SCD, there is a 10-point scale, but only one of the four judges really grades like this. One of them only really uses a five-point scale, because she never gives lower than 5. In 12 series, one judge has given 113 ’10s’, another 146 and another 35, but they’re all supposed to be grading on the same scale. She used this to encourage us to think about whether differentiated grading is useful or not. I first learnt about the concept of teacher cognitions (what teachers know, believe and think) at the IH DoS conference in January this year. I believe it has a big effect on participants in CELTA courses and how receptive they are to the training they receive. I chose to go to this talk in the hope of finding out more. In a nutshell, Karla’s research was to investigate what the trainees believed coming on to the course, whether this changed through the course, and how it influenced their performance. She did a combination of interviews and observations with 8 trainees from 3 different courses. Most of them had unrealistically high expectations of what they might be able to learn on a four-week course, including ‘grammar’, a formula for how to be a good teacher, or a completely new way of approaching teaching. By the end of the course, they recognised that it was impossible to cover all of this within the time constraints, but still found the learning experience to be ‘rich and far from disappointing’. As they said, CELTA can only give them an insight of what teaching is and experience will give them the rest. They highlighted the importance of planning in their post-lesson reflections, as they realised that problems in the lesson often stemmed from a lack of preparation. Based on negative experiences they had had in lessons, trainees had aspects of teaching they would prefer to avoid after the course, for example, CCQs (concept-checking questions). Despite this, they recognised that they needed to give techniques a fair trial before discarding them categorically, and that a four-week course was not enough time to say that a particular technique would or wouldn’t work. Coming on to the course, most of the trainees talked about their own previous negative experiences learning languages and expressed that language learning needed to be fun to be effective, with a good rapport between teacher and students. This led to them prioritising fun in their own evaluations of their lessons, often disregarding what the trainer had to say about the lesson in terms of how successful it was if they (the trainees) thought that it wasn’t fun. There was a belief that language teachers need to be different to teachers of other subjects, since language teaching cannot be as teacher-centred as other subjects: interaction is crucial. By the end of the course, classroom management was added to the list of desirable teacher characteristics, in addition to subject knowledge and good rapport with students. During the courses, there was shift towards a more student-centred approach to teaching. However, trainees stated that when teaching more student-centred lessons they felt less professional, and less ‘teachery’, which echoes my own informal observations of the need for trainees to adopt ‘teacher position‘ to feel like they are being effective and useful to the students. There is a continuous struggle against deeply rooted previously ‘learned’ behaviour, either from their own experience in the classroom or from the ‘apprenticeship of observation‘: what they have learnt from being a student and observing their own teachers. In the Q&A session at the end, a trainer in the audience highlighted that sometimes we are not very good at managing expectations during the CELTA course, and that perhaps we need to revisit them more often. Another trainer suggested including regular slots in input sessions where you encourage trainees to compare what they have learnt about teaching with their own beliefs about how to teach. This is definitely an area which warrants further research, and one in which I will watch developments with interest. This was the final talk I went to at IATEFL this year, and was a great note to finish on as it inspired me to consider a completely different approach to putting together a CELTA course by rethinking it from the ground up, rather than basing it on more traditional structures. Joanna and Emma wanted to remove as much of the stress from the CELTA course as they could and make sure that their trainees were as prepared for real-world teaching as possible. To do this, they decided to get rid of language instruction from the timetable, since this is the most stressful area for most trainees. Replacing language analysis sheets with task analysis, focussing on the specific activities that trainees were planning to use. Different sheets were used for receptive and productive tasks. This had many effects on the trainees, for example realising that lexis is important for listening tasks. Trainees also created more meaningful productive tasks as a result. Basing the language skills assignment around task analysis sheets which had been used in previous TPs, with trainees reflecting on what problems the students had with the language and re-planning the lesson in light of this. This is instead of the over-analysis and the added stress of a more traditional assignment, which can create an atomised view of language. It can also mean trainees over-explain to students because they try to give them all of the knowledge they have instead of just what is relevant. Teaching a model lesson at the beginning of the course in the same way and using the same materials that they expected their trainees to use, then incorporating more explicit reflection on the model lesson throughout the first week of input, unpacking the techniques used in it. Trainees were noticeably better at lesson cohesion after this. Adding a 20-minute slot at the end of TP where trainees could speak to students about what happened in the lesson without trainers in the room. This was recorded, and fed in to the Focus on the Learner assignment. Trainees were more aware of their students as people and of their needs, and better able to understand their accents. There was also higher student retention because of this, and this reflects the real world, since student retention is something we all need to be aware of. Encouraging trainees to note questions they wanted to ask the students and their co-teachers while observing. Learning more about students meant TP points weren’t needed after week one, as lessons were based around student needs, although a course book was still used. Changing the layout of the lesson plan, including a column for self-evaluation. Before seeing trainer comments, trainees had to fill in a stage-by-stage reflection, rather than only reflecting on the lesson in general. They got very positive feedback from their trainees on this course. They developed their language awareness naturally, in a similar way to how teachers do in the real world, and language became much less scary as a result. They also realised how important lexis was and were much better at teaching it because they had built up a good rapport with the students through the 20-minute conversations. Students weren’t afraid to ask how new lexis should be used. Trainees were also much more self-critical and reflective as a result. This is definitely a course structure I would like to find out more about, and I think it will influence my own course design when I finally put together a CELTA course myself as a Main Course Tutor (I’m an Assistant Course Tutor at the moment).